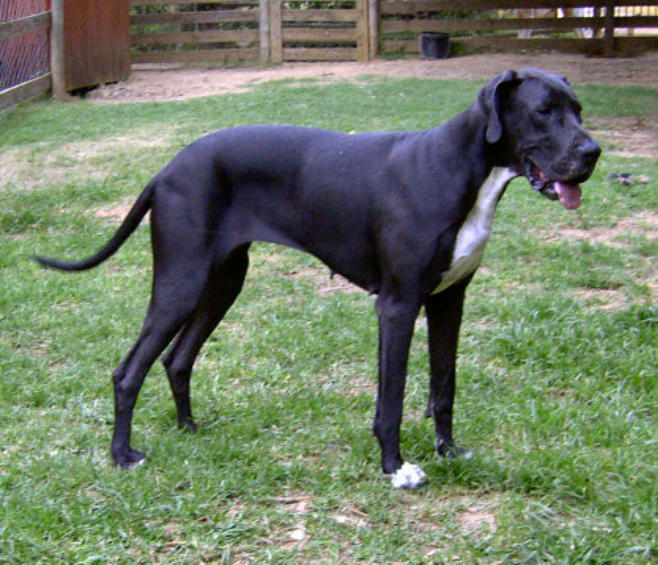 • Sire : RBISS Ch Cherriton Granite HD00 ED00 • Dam : RBISS Ch Chardonee Highly Polished of Cherriton HD00 ED00 • Bred by : Terry Batchelor & Liza Fenton, Cherriton Great Danes, Johannesburg, South Africa Maus was a wonderful girl with the sweetest temperament and a wonderful pedigree. While Maus never graced a showring due to her white markings, she was a very precious girl in our household and deserving of her title as "The Nanny". Maus's dam was the exquisite Ch Chardonee Highly Polished (HP) - a litter sister to our beloved Hamba. HP was awarded RBISS at the SAGDA Ch Show in 2001. Maus's sire was none other than the magnificent RBISS Ch Cherriton Granite - a proved producer of quality. Maus was mated several times, but never fell pregnant.